Why is it that we restrict certain flavors, smells and tastes to particular times of year? Thanksgiving is synonymous with turkey, Easter (like it or not) is hard boiled eggs and Christmas- well, the best food of the year can be found during this extended time! Cookies, homemade marshmallows and Chex Mix! 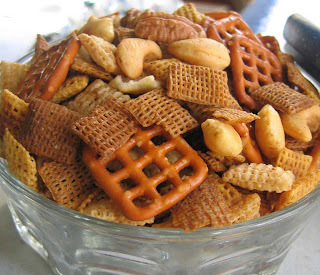 Honestly, why not make Chex Mix in March, or July, or for Halloween?? 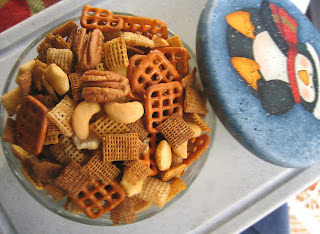 I'll admit that historically I have not made Chex Mix outside of the winter holidays- but I think that may change! This recipe is so addicting, Dave has dubbed it Heroin Mix, (Crack Cake was already taken!) Literally we ate pounds of the stuff; the moment we arrived home from work- you could find the two of us standing at the counter shoving handfuls in our mouths. Maybe this is the reason we only make these type of treats once a year... because otherwise I'd need to put a treadmill at my desk instead of my chair!! This recipe is basically my Mom's; her holiday baking and cooking is indescribable- simply out of this world!! Next year I'm flying home early to get in on all the goodies!! Talk about Fat and Happy... yum. In a large deep (4 or 6 inch) roasting type pan, you may need two pans depending on what you have available, add all the below dry ingredients. Drizzle the melted ingredients over the dry, gently toss and mix until all is well coated and evenly distributed. Bake in the oven at 250 degrees for a couple of hours, until dry. Occasionally gently stir. Try not to eat too much while it's cooking- but good luck with that! !